Well... almost! 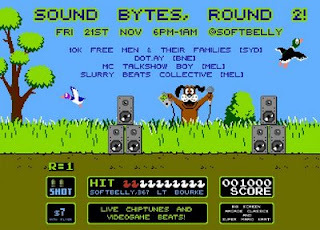 By the weekend the flyer for the November 21, Sound Bytes gig @Softbelly bar will be hitting the streets of Melbourne, getting holders $7 entry (instead of $10) to the gig. The flyer looks fantastic (if we do say so ourselves) and is definitely worth grabbing for your wall/desk/viewing pleasure. If you want to get your hands on one leave a comment so we can let you know which of your fave gaming stores/cafes etc to hit for cheaper entry. Til then, check it out to the left!